Don DeYoung, Ph.D. (pictured), one of the world’s leading creation scientists, will head “Rocks by Day, Stars by Night,” a 190-mile rafting trip down the Colorado River through the Grand Canyon June 5–11. The rafters will encounter all the major rapids and geological points of interest along the river during the day, and in the evenings Dr. DeYoung will teach astronomy, using a telescope for participants to see details of the created heavens. Accompanying Dr. DeYoung on the trip will be Carl Kerby, vice president of the sponsoring organization, Answers in Genesis. Dr. DeYoung is professor of physics at Grace College in Winona Lake, Indiana, and holds his Ph.D. in physics from Iowa State University. He has taught at Grace College for 37 years and is known for his gift of explaining complicated issues in an understandable way, whether his audience is a college class, adults, or children. His work has taken him around the world, from Nova Scotia and Europe to Australia, New Zealand, and Tonga, where he has taught, conducted research, and pursued busy speaking schedules. He is president of the Creation Research Society, a professional society of 1,700 scientists. 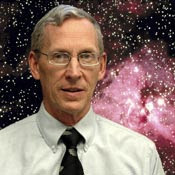 Dr. DeYoung, author or co-author of 15 books dealing with creation science, first started exploring the creationist viewpoint as a Ph.D. student at Iowa State University. “It was at a time when the Christian faith kind of opened up for me,” he recalls. While a doctoral student at Iowa State, he met a local pastor who explained Christian ideas to him, which he had not understood before then. He also met Dr. John Whitcomb from Grace Theological Seminary, a leading theologian and creationist. He and Dr. Whitcomb have co-authored a number of books. Dr. DeYoung’s newest project is another book, his 16th, entitled Discovery of Design, scheduled for publication this fall.